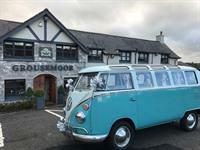 The Grousemoor Country House is renowned for personal service, passionate management and luxuriously laid-back atmosphere. 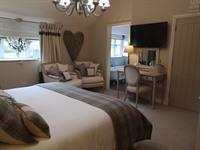 The building is a converted coaching inn, dating back to the 1650s, situated in Llandegla, between Ruthin and Wrexham. This part of Denbighshire in North Wales is particularly stunning with rugged moorland, forests and valleys. The perfect setting and venue for your big day! The recent renovation work has created a warm, intimate atmosphere. We have retained period features like stone hearths, oak beams and teamed this with a contemporary décor and furnishings. Everybody is considered to be part of the family during their stay. From the very moment, you book your wedding at The Grousemoor Country House, you will be able to create your very own bespoke wedding with us. Nothing is too much trouble, so just ask! We will take care of you from the original point of enquiry right through to the big day itself. 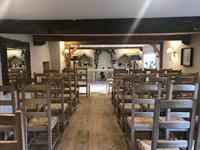 If you would like a church wedding, St Tegla’s in Llandegla, our local village is just a short distance away. Listen to the church bells ring as you get ready, a stunning country setting overlooking the Welsh hills. We have a licence to conduct the registration of marriages. This must be arranged by the bride and groom. We recommend that you check availability for your chosen date prior to booking the space for the ceremony by contacting Denbighshire county council direct. Exclusive use – there will be no other guests at The Grousemoor during your wedding, we can cater for weddings of up to 60 guests during the day for the ceremony & 100 guests in the evening. Dependable service is at the foundation of every great Grousemoor Country House event. 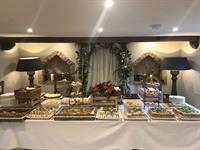 Our dedicated catering team will guarantee the success of your special occasion by providing a variety of delicious buffet style food during the day & evening which will be tailored to suit individual tastes and budgets - 60 daytime guests and 100 evening guests buffet style. With a reputation for quality food, beautifully presented that meets and exceeds expectations. We have capacity for 35 for a traditional sit down wedding breakfast. We have accommodation for 12 guests on the evening of your wedding which is an additional cost to the venue hire, however this can be passed on to your guests. Additional extras: Why not choose to stay the evening prior to the wedding & start your celebrations in luxury & style. If all the accommodation is booked the evening prior to the wedding, we offer complimentary afternoon tea for all guests staying with us upon arrival at 2pm. Dinner can also be arranged at an additional cost.